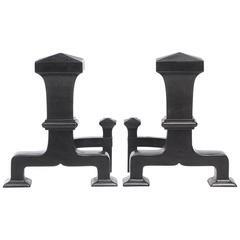 Americana Hessian soldier andiron pair in painted cast iron. Wear includes heavy patina to metal appropriate to age, use and materials. The pair is in good condition. 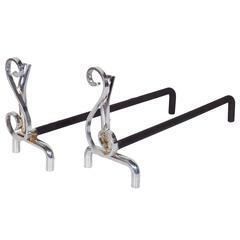 A pair of andirons, produced circa 1950s with scrolls styled after musical notes. Very good vintage condition with age appropriate wear. 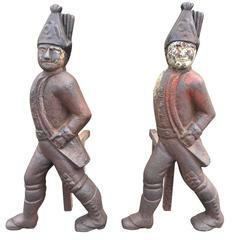 Pair of 19th century cast iron Hessian soldier andirons. Early 19th century Hessian soldiers andirons. A substantial pair of patinated cast iron andirons having expressive pyramidical finials. 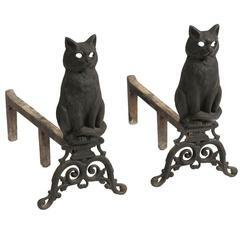 Turn of the century perched cat andirons. Pair of cast iron andirons in the form of cacti / cactus. The perfect fireplace decor for the desert Ranch house.